Opis: Indian Trade and Bullion Import in the Eighteenth Century (Classic Reprint) - McMinn Charles W.
This little pamphlet is simply a chapter from my forthcoming work on the Wealth of India, and I bring it out not because it is complete, but because much more is required in order to give a satisfactory account of the very fitful economic progress of India during the eighteenth century. One at any rate of my authorities, Raynal's Statistical Atlas published in 1770, has apparently never been seen by any historian of India j no copy of Raynal which I have ever seen, there are several in Calcutta libraries, contains this atlas, which supplies from official sources the statistics of the three Companies - English, French and Dutch, from the earliest date. Milburn published two ponderous tomes full of trade statistics, jumbled up in the greatest confusion - India and China sometimes separate, sometimes united, the facts for different periods for the same trade scattered over the two volumes; there is nowhere continuity of treatment for India nor any solidarity of principle. Sometimes a trade is given under a geographical heading, such as Calcutta or Canton, sometimes under a subject heading like tea or piecegoods: bewildering confusion is the result. Mill depended for his account of the trade mainly on Milburn, and, as a result, his treatment is fragmentary and imperfect. Montgomery Martin in his "Colonies of the British Empire" gives figures which are probably reliable from 1802, but which are apparently erroneous for the period with which I am dealing. Whitworth's tables which Mill quotes are reproduced in Raynal, but I think imperfectly. In fact this little brochure is intended to show the defects of my work and to elicit help from others. 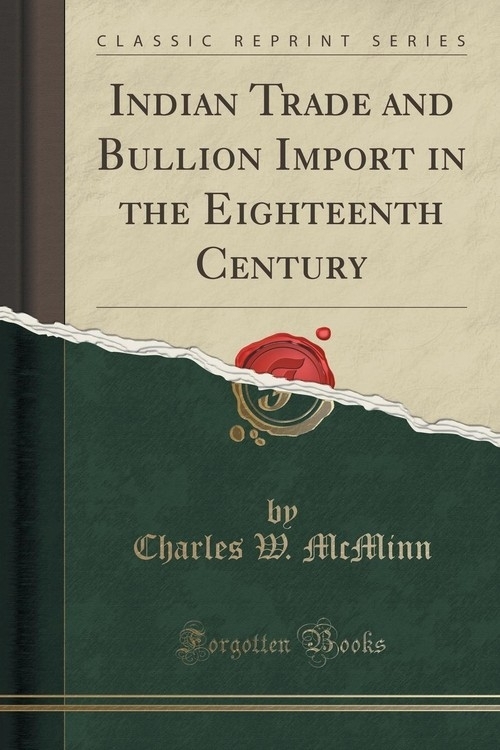 Szczegóły: Indian Trade and Bullion Import in the Eighteenth Century (Classic Reprint) - McMinn Charles W.
Recenzje: Indian Trade and Bullion Import in the Eighteenth Century (Classic Reprint) - McMinn Charles W.